QANTAS Airways will soon take delivery of its fourth Boeing 787-9 Dreamliner. The pictured VH-ZND was unveiled by the airline on February 14, 2018. The following day VH-ZND made its first flight by Boeing from Paine Field near Everett, Washington. However it was cloudy. Yesterday VH-ZND flew again (above) and it was in full sunshine at Paine Field. Nick Dean was there to capture history. As previously reported, VH-ZND is decorated in a special livery honoring Aboriginal and Torres Strait Islander Australians. The new livery features the work of the late Northern Territory artist and senior Anmatyerre woman, Emily Kame Kngwarreye*. It is based on her 1991 painting, Yam Dreaming and has been adapted for the aircraft by leading Indigenous owned design studio Balarinji. The artwork depicts the culturally significant yam plant, an important symbol in Emily’s Dreaming stories and a staple food source in her home region of Utopia, 230km north-east of Alice Springs. 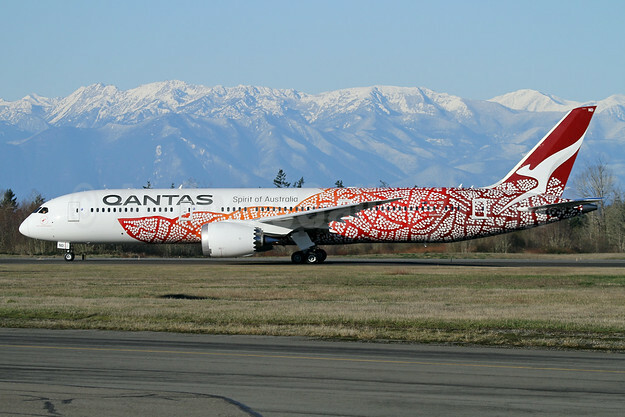 The aircraft itself is named Emily Kame Kngwarreye in tribute to the artist. The aircraft will fly direct for approximately 15 hours from the Boeing factory in Everett, WA to touch down in Alice Springs on March 2, 2018 where it will be welcomed by Emily’s family. VH-ZND will then fly to Sydney and Melbourne for crew familiarization flights on QANTAS’ domestic network before it enters service on international routes from late March. This is the fourth Dreamliner to enter the QANTAS fleet, following the arrival of Great Southern Land, Waltzing Matilda and Quokka. 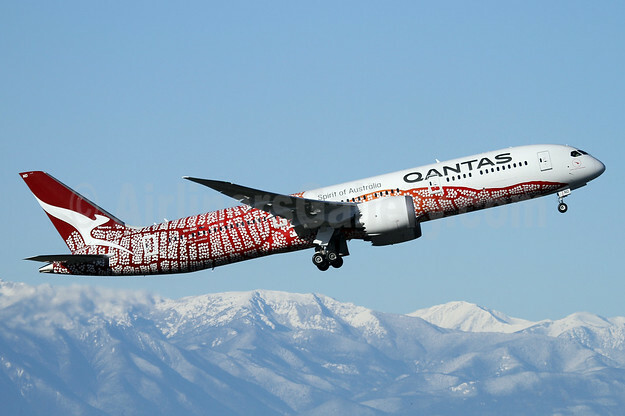 Copyright Photos: QANTAS Airways Boeing 787-9 Dreamliner VH-ZND (msn 63390) (Yam Dreaming) PAE (Nick Dean). Image: 940992. This entry was posted in QANTAS Airways and tagged Boeing 787-9 Dreamliner, msn 63390, QANTAS Airways, VH-ZND, Yam Dreaming on February 20, 2018 by Bruce Drum.